The last time I saw my friend Annette from college we went to this great french cafe called Cafe Luluc. It’s close by in Cobble Hill and typically their brunch line on weekends is out the door. They had (have?) 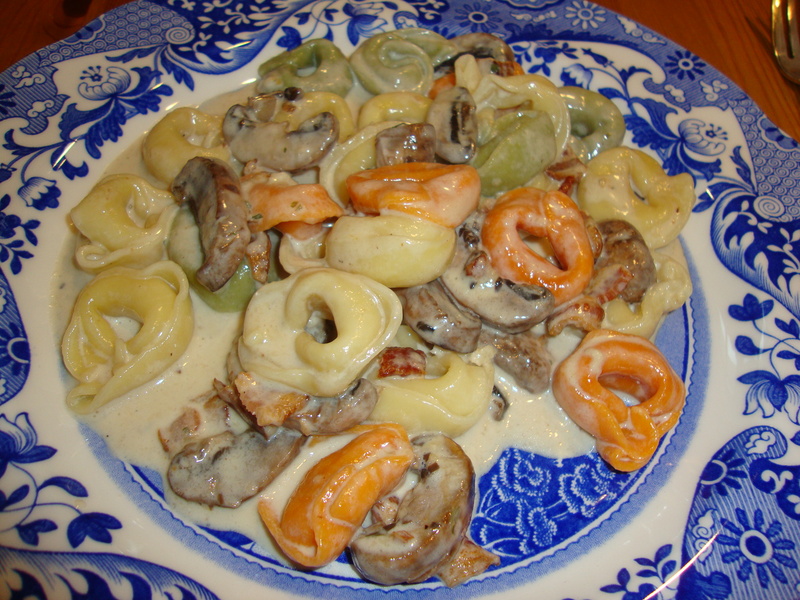 this killer dish with mushrooms and tortellini that I decided to try replicating since I had leftover crimini mushrooms from when we made the shrimp skewers. It might not be the prettiest dish to look at, but it was delicious! I will definitely make this again, as should you. I bought frozen cheese tortellini at the grocery store. I like to buy the tricolor kind simply because in my mind it’s healthier and I love color. After all, I’m the same girl who wore different colored socks from 2nd to 7th grade because of a dare (thanks Grace Williams!). 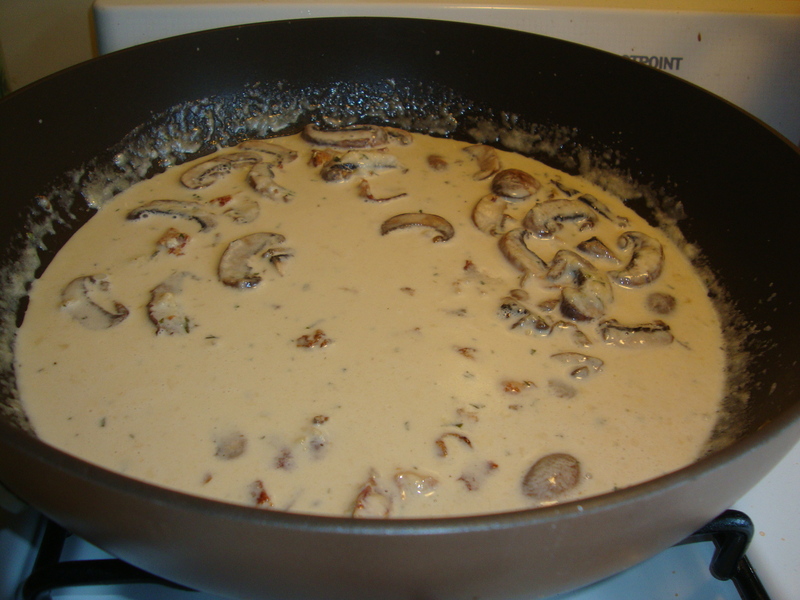 Besides, with mushrooms and cream this dish could use the color. Also, I added bacon because I had 3 pieces leftover in the fridge from my uber yummy Pimento Grilled Cheese. I would definitely encourage you to add bacon as well. It really intensified the flavor and added this hearty smokiness to the dish. I would have added more probably if I had it. Some recipes I looked at had walnuts or other nuts but since I was using parmigiano-reggiano cheese (which is a little nuttier than regular parmesan) I decided not to bother stretching my food dollar! -~7 sliced crimini mushrooms. You could certainly use more but this is all I had leftover. A different type of mushroom would work too. I started by getting my mushrooms and garlic in a saute pan with olive oil over medium heat. I let this cook for at least 5 minutes before adding in my heavy cream, cheese, bacon, pepper and parsley. At about this time I turned on the heat to boil my pasta water. Cook the tortellini (it’s done once they all float up to the surface, usually 3-5 minutes). In the meantime, keep stirring your sauce over low-medium heat. I kept scraping the bottom so it wouldn’t burn. It will start to thicken up a little bit. Drain your pasta and enjoy! I actually added the tortellini into my sauce skillet since I think pasta tastes better when it’s actually cooked with the sauce for a minute. I think I ate my whole plate before the hubs it was that good (hard to believe, Danielle!). If you want more food or you are cooking for a bunch of men you could always add some chicken to this. They like that (smh). I’m making this for Chelle when she comes home next week. Thanks Sum!